A Graphic Notebook on Feminism, Su Negrin (1970). Image courtesy Sung Pil Yoon. The Vancouver Women’s Bookstore opened in the summer of 1973. We’ve been told it set up shop in an old Victorian house somewhere on Richards Street. Rent was cheap—cheap enough that the Bookstore’s owners could afford to make donations to local women’s centres and other projects they cared about. We heard they lent Ferron (do you know her?) a grand to help her record her first album. From the street you could see the store’s bookshelves, then behind that, up a couple of steps, was a raised area where there was a desk and a few couches. There was coffee and a small library. The walls back there were covered in posters, mostly from a women’s collective in Chicago. We’ve been told that the shelves were stained by the same volunteers who would keep the place running for the next twenty-some years. Three break-ins, a firebombing, and two relocations later, the Bookstore closed in 1996. We haven’t seen pictures but we imagine the shelves were a nice colour. While doing some archival research this June, Alexandra dug up the Vancouver Women’s Bookstore’s inaugural 1973 catalogue. We examined the document as if it were excavated amber. More than just a record of its inventory, the warmly typewritten pages captured the spirit of a community formed during a critical period of intellectual production by and for women. The Bookstore was a setting where individual experience could be elaborated, made material, through social life. The books provided a common language; the shelves, a common space for conversation—between generations, continents. So consider this an invitation to its restaging. 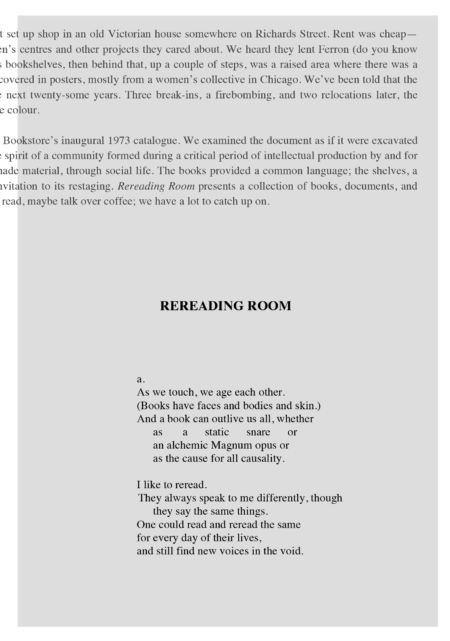 Rereading Room presents a collection of books, documents, and periodicals selected from the titles offered by the Bookstore in its nascent years. Come by, read, maybe talk over coffee; we have a lot to catch up on. 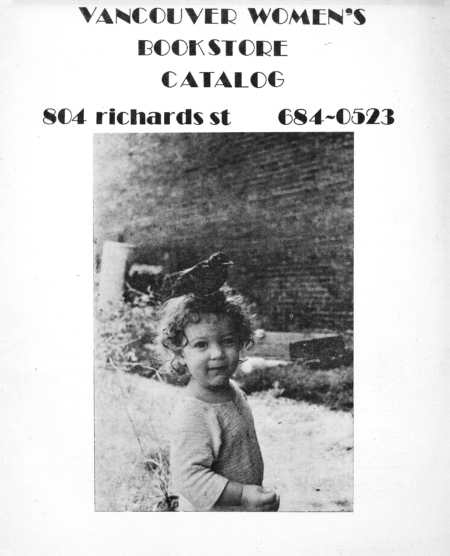 The Vancouver Women’s Bookstore’s inaugural mail order catalogue was published in October 1973. A selection of 75 titles from the catalogue will be available to read at 221A for the duration of the project. We would like to thank a number of individuals and organizations for the invaluable insight, support and archival resources that made this project possible: Kathleen Hudson, Jeannine Mitchell, the BC Arts Council, The Morris and Helen Belkin Art Gallery, Simon Fraser University, and AtoM Archives.